Fly fishing Howes Lagoon in Tasmania. THE ONLY THING the average person knows about Tasmania is that it’s home to a whirling, drooling, homicidal cartoon character with a particular taste for rabbits. Asked for any information beyond that, most folks draw a blank. Even the location of the island is not well known; upon hearing that I was going on a fishing expedition to Tasmania, one friend said, “I didn’t know they had trout in Africa.” (He was thinking of Tanzania, a country in East Africa where, in fact, they do have trout.) 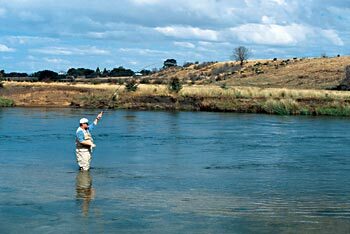 However, fly fishermen who are interested in inexpensive, exotic destinations should break out the atlas and familiarize themselves with this small island off the coast of Australia, for it offers beautiful scenery, uncrowded waters, and the chance to catch a double-digit trout. The smallest of Australia’s states, Tasmania (often shortened to “Tassie” by its inhabitants) lies about 200 miles south of Melbourne, across the treacherous Bass Strait. For such a small island, it offers visitors no shortage of things to see and marvel at. Tassie is only about the size of West Virginia, covering an area of just over 26,000 square miles, but it features a remarkable array of different climates, terrain, and ecosystems. The western half of the state is an inhospitable labyrinth of steep mountains and deep canyons, where the average annual rainfall is nearly 120 inches, and where the land is battered by the wind and the ocean. The eastern third of the island is more temperate, however, featuring scenic sheep farms, rolling hills and small mountains, and a beautiful coastline. Andrew Harris is a full-time fly-fishing guide from northern California. In the center of the island is a strange and wondrous geologic formation, the Central Plateau, which is a Mecca for Aussie trout anglers. Scoured by a single sheet of ice during the last ice age, the Central Plateau is a stark, rocky plain dotted with thousands of lakes — some natural, others created to form the island’s massive hydroelectric system. These waters range in size from veritable puddles to the monstrous (and aptly named) Great Lake, and many of them hold bragging-size browns and rainbows. Because of the relatively high altitude and the cool weather on the Central Plateau, even the biggest trout — those that weigh 8 pounds or more — stay in the shallows for most of the summer, which makes for a stillwater fishery unlike anything in the U.S. From late November through February, anglers flock to the area to sight-fish for trout cruising in the shallows, a technique known locally as “polaroiding.” It’s the freshwater equivalent to stalking bonefish on the flats, for the angler must be careful not to spook the fish before making an accurate, well-timed cast. According to one Tassie guide, it’s not uncommon for fishermen to develop a sort of “buck fever” that renders them inept the first time they’re faced with a 10-pound brown sipping dry flies in a foot of water. Over the past decade, I’ve been hearing rumors about the fantastic fishing in Tasmania, but these whispers are usually drowned out by all the publicity about New Zealand, which lies to the east, across the Tasman Sea. The fly-fishing infrastructure in Tasmania is much less developed than that of New Zealand, so American anglers don’t see many ads for Tassie guides and lodges or many articles by writers who have traveled there. Unlike their loud, raucous Kiwi neighbors, Tasmanians are generally reserved, quiet, and not given to boasting, which may explain the lack of international buzz about their lakes and rivers. Either that, or they want to keep this wonderful fishery to themselves. My friend Sandy Hays and I planned a one-week self-guided tour of the island to investigate the angling possibilities. Because Tasmania has a well-developed system of roads and campgrounds near the good fishing waters, we decided to travel around in a rented campervan (which we call a “motor home” in the U.S.). Of course, no one can check out all the rivers and lakes on the island in one visit, but a campervan does allow you the freedom to move at will and helps to save money on hotel rooms and meals. Keeping costs down was made easier by an exchange rate that paid two Australian dollars for every one American greenback. Tassie angler Tim Urbenc shows off a Central Plateau brown trout. In order to experience several different kinds of fisheries — the big “hydro” lakes of the Central Plateau, the famed Western Lakes, and the Macquarie River system — we arranged to fly into Hobart, on the southern coast, and fly out of Launceston, 198 kilometers to the north. One aspect of fishing in Tasmania that made our trip planning easier is that there is public access to almost all waters. 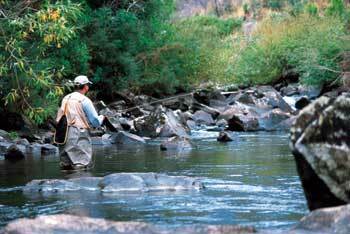 Even where rivers flow through private property, landowners will usually grant access to anglers who ask politely. Twice, we knocked on farmhouse doors to get permission, and on both occasions the owners seemed downright pleased to have us on their property. An American accent opens a lot of doors in Tasmania. After we spent a night in Hobart, recovering from the long flights, the first stop on our tour was Salmon Ponds, Tasmania’s only fish hatchery, which is about an hour’s drive northwest of Hobart. Built in 1864, it is the oldest trout-rearing facility in the Southern Hemisphere, and for anyone who has ever been to an American trout hatchery — with its concrete troughs and chain-link fences — the beauty of Salmon Ponds is refreshing. Reflecting the British flair for gardening, the landscaped trout pools are surrounded by gorgeous bushes and exotic trees, and there are benches that allow you to relax while watching big rainbows, browns, brookies, and albino trout cruise lazily in the many long pools. Salmon Ponds is also home to the Museum of Trout Fishing, which tells the story of the persistent Tasmanians who struggled to bring brown-trout eggs halfway around the world from England in the 1860s. Twice, the precious cargo set sail on the months-long journey, only to have the ice melt before the ship reached Tasmania, ruining the eggs. Finally, on the third attempt, the ship arrived in time, and the fishery was born. The trout raised in the hatchery were then carried on horseback to lakes and rivers all over the island. The road from Hobart to the Central Plateau parallels the Derwent River for much of the way, winding among rolling hills dotted with small villages. Once you begin climbing into the mountains, however, the scenery changes to vast forests of gum trees which give the landscape an otherworldly, Dr. Suess-like feel. After a very steep stretch, featuring a series of sharp switchbacks, the road flattens out and emerges from the forest onto the Central Plateau. The North Esk River meanders its way through a high plain containing several cattle ranches before it begins a sharp descent, whereupon it becomes a classic freestone stream. Just beyond the crest of the road is a group of shallow reservoirs, which some anglers refer to as the Bronte Lakes. The most popular and productive of this group is Bronte Lagoon, known for its big fish and abundant hatches. In close proximity are four other good lakes — Tungatinah, Dee, Bradys, and Laughing Jack. Most of these lakes are right off the road, so it’s possible to chase hatches or find feeding fish by hopping from lake to lake over the course of a day. One of the intriguing features of these smaller hydro lakes is that they have large shallow areas where trout cruise, looking for baitfish, tadpoles, and hatching insects. Because wading is so easy, many anglers are tempted to jump right in the water and start walking the shallows, but experienced Tassie fishermen know that the fish are often close to shore. While Sandy and I were rigging up at Bronte Lagoon, we watched two fishermen approach the lake, stop about 20 feet short of the waterline, and begin casting. Only after they had covered the water within ten feet of shore did they advance. Unfortunately, our day on Bronte was marred by high winds, which can be a problem in the Central Highlands. In the late afternoon, mayfly spinners filled the air, but there was such a chop on the water that the fish were not rising to them. The gusts were so powerful, in fact, that we were forced to seek the lee side of a stand of trees just to cast. Eventually, we gave up and instead spent our afternoon exploring the gorgeous Cradle Mountain-Lake St. Claire National Park, about 45 minutes away. The larger hydro lakes — especially Great Lake and Arthurs Lake — have earned reputations for producing many huge browns and rainbows. Although there are numerous shallow bays where wading anglers can fish, these big waters are best fished from a boat, and many Tassie anglers employ British “loch-style” fishing techniques — such as drifting nymphs downwind from a boat trailing a drogue — to great effect. Some American fly fishermen find these methods too static and boring, so if you hire a guide, you should let him know your angling preferences. The real jewels of the Central Plateau are to be found on a high, barren, windswept plain west of Great Lake. Although hundreds of small waters make up the Western Lakes, some accessible only via off-road vehicle or a long hike, most anglers head for an area called the Nineteen Lagoons, which is known for great polaroiding for big fish. The Macquarie River flows through the beautiful agricultural valley south of Launceston. 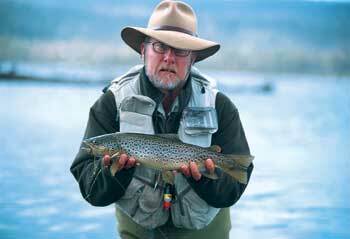 Here the author fights a trout that took a wet fly on the swing. We received an expert tour of the Nineteen Lagoons from two experienced Tassie anglers, Jim Ferrier and Cliff Oliver, whom I had met on the Internet from my home in Pennsylvania a few weeks earlier. Jim drove down the gravel road that winds among tiny ponds, 100-acre lakes, and waters of all sizes in between, and he regaled us with stories of big trout caught by members the Fly-Fisher’s Club of Tasmania, of which he is a member. It seemed that every lake had at least one monster brown associated with it. As Jim explained, many of the lakes are stocked with large trout each year. Although there is little natural reproduction, most of the fish hold over through the winter and grow even bigger by feeding on the abundant insect life. In the spring, much of the land floods, and the fish can move around from lake to lake. Thus, any depression that holds water throughout the summer can hold fish. He pointed out a borrow pit leftover from the construction of the road, and told us of the 12-pound browns that are often visible cruising just under the surface. 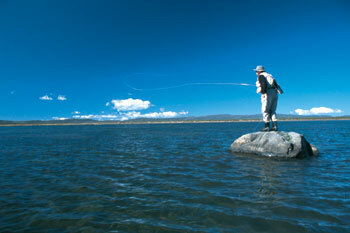 We started the day fishing on Kay Lagoon, which is typical of the featureless, shallow lakes in the area. A slight depression carved out by a glacier, the lake was no more than 3-1/2 feet deep at any point, so we could wade all the way across. We spent the morning casting drys and nymphs to the edges of large weed beds. Although nothing was hatching, we could see fish rising occasionally, so I tried a small olive Comparadun. I caught one 12-inch brown trout right off the bat, but then things slowed down. I cast into an opening in the weeds, and a massive trout nose poked through the surface and took the fly. I lifted my rod tip, but the fish was gone. I was left standing there, my heart was pounding, unable to believe that I had just missed my best chance at one of Tasmania’s giant browns. That was all the action we saw at Kay, and the wind soon began to howl. It was becoming clear that our decision to visit Tasmania in mid-March was turning out as we had expected: we’d managed to arrive during the doldrums that occur at the end of the summer hatches. So we left the Central Plateau and headed for the Macquarie River valley, near the town of Longford. Unfortunately, we found that the island’s hydroelectric system was generating power nonstop, which meant that the Macquarie, which is fed by the reservoirs above, was almost too high to fish. We set up a base camp in Longford, and from there we fished the Macquarie, North Esk, and South Esk Rivers, as well as Brumbys Creek. Jim and Cliff introduced us to their friend, John Dekkers, and he showed us his local hotspots. Because of the high water, we caught mostly small fish along the banks, but the rivers themselves are gorgeous. The Macquarie resembles a cross between an English chalkstream and a large Western river, as it meanders through rolling hills of farmland. There are a couple of dams, and the impoundment called Brumbys Creek, in the town of Cressy, is known for its big fish. On our last day in Tasmania, we visited Stan Abdilla, a local taxidermist who also works as a fishing guide. We had obviously arrived too late in the season for the good fishing, and John said that Stan could show us what we’d missed. Because Tassie anglers prefer skin mounts to replicas, Stan’s freezer was packed with fish ready to be mounted: among them were several browns over 10 pounds (including one monster that was easily 15) and about a half dozen rainbows in the 8-pound class. It was an astonishing display of the trophy fish produced by waters all over the island. According to Stan, a few of the fish had come from accessible rivers on the western coast that hardly anyone ever fishes. Looking at those huge trout, I vowed to return one day at the height of the fishing season. I had been completely won over by the landscape, the waters, and the people of Tasmania, and now I had proof that the fishing could be far better than we had experienced.